All it took was one little "Yes"
We have hosted five students in the last five years. Three have been from Germany and two from the Netherlands. 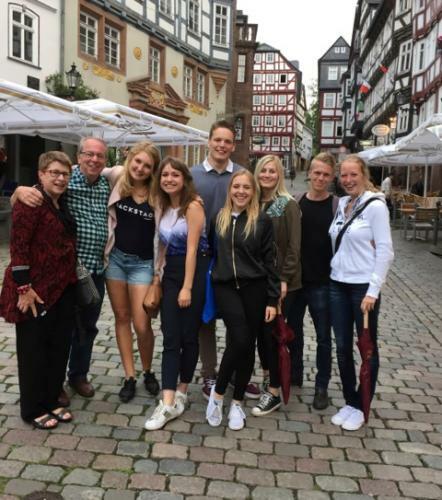 Last month, we met up with all of them again in Marburg, Germany when we went to bring our younger son home from his exchange year at Philipps-Univeristät. It was the first time all of our students had met each other. It was a wonderful weekend. Within minutes, all of them were talking and swapping stories as if they were old friends. It was so interesting, that although they all had different personalities and different interests, they were bonded through the face that they were all our “kids” and had shared a common life with the Germanns in Springfield, Illinois for ten months each. There was a lot of eating, laughing, and exchanging of embarrassing or hilarious stories. It was as if they already knew each other, more as if they were renewing old friendships rather than starting new ones. One of the best things about being a host family is that it inspired our son Charlie to spend his junior year in Germany. It gave him the knowledge of what to expect when he was adjusting to the culture and life in a new country, the emotional ups and downs that he would experience. It was also comforting to know that he already had “family” in Europe, and made a strong network of new friends at school. His new friends are fellow exchange students from the United States and other countries, and native German students. People often ask us if we stay in touch with our students. We always tell them that we do, and when we meet up with them again, it’s as if no time has passed. Two have already come back to visit, and one is coming back in October. Our son Charlie made a very good Russian friend at school in Marburg, and she will come visit us this month. AYUSA really did open our lives to new cultures and possibilities. Our first student was a last minute placement. That email from our local AYUSA representative, Patti Good, looking for a home for Tom forever changed our lives. All it took was one little “Yes.” We would do it all again in a heartbeat. Thanks much for giving us the world.